Its Festivus, I’ve had dinner, so here I will air my grievances. I think everyone should do this. Its cathartic. Florida Hospital. I am sick of you and never want to visit you again. Aging. I hate you too, especially for making my son older. Stop it now! November and December. You two have sucked. Seriously. House. Stop needing repairs immediately. That goes especially to the plumbing. Son. Start needing your mommy again. Father. Quit the damn smoking already! How stupid can you be? Mother nature. Summer was too hot. Make next one better. In other news, my mom is out of the hospital but back in the rehab facility. They’re on top of things now, and everybody seems to know who I am. I do not believe there will be another mistake again, at least not a big one. I went over there earlier to drop off her stuff and they double checked with me about her next dialysis (they knew when it was) and helped me make sure my mothers clothes were all labeled so nothing gets lost. They’re giving her a room by herself too, at least for now. I will leave you with a picture of one of my favorite Christmas decorations. It was my grandmothers stuff. 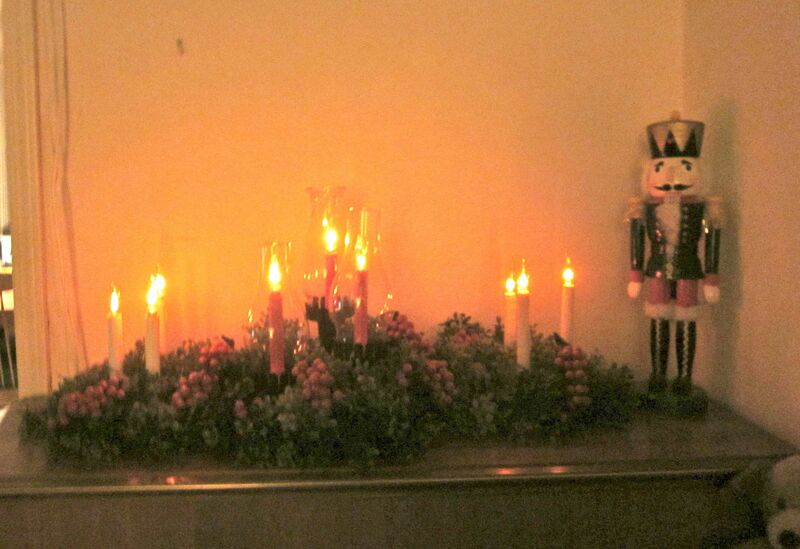 Its flickering electric candles with plastic boxwood and plastic berries. It feels so much like Christmas.